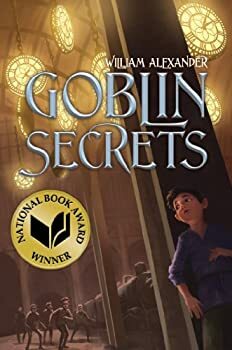 William Alexander won the National Book Award for his debut novel, Goblin Secrets — praised by Kirkus Reviews as “gripping and tantalizing” in a starred review — and won the Earphones Award for his narration of the audiobook. He studied theater and folklore at Oberlin College and English at the University of Vermont and currently lives, writes, and teaches in Minneapolis. Ghoulish Song is his second novel. Visit him at WillAlex.net and GoblinSecrets.com. CLICK HERE FOR MORE BY WILLIAM ALEXANDER. My family and I were just quasi-playing a game called Booktastic the other night (quasi as in just reading questions from the cards rather than actually playing the game), when the question came up to name an award-winning book whose awarding you just didn’t get. I believe I chose an entire year of finalists one year for the National Book Award (All five. Every one.). Now though, I’d have to add this year’s winner for Young People: William Alexander’s Goblin Secrets. Alexander’s debut novel isn’t by any stretch a bad book, but it is, in my mind, under-developed and unfocused and in the end, unsatisfying.